I haven’t been making too many cards lately and the ones I have made haven’t been that detailed so instead of having a single post for each card, I thought I’d shove a bunch into this post and quickly describe what I did. 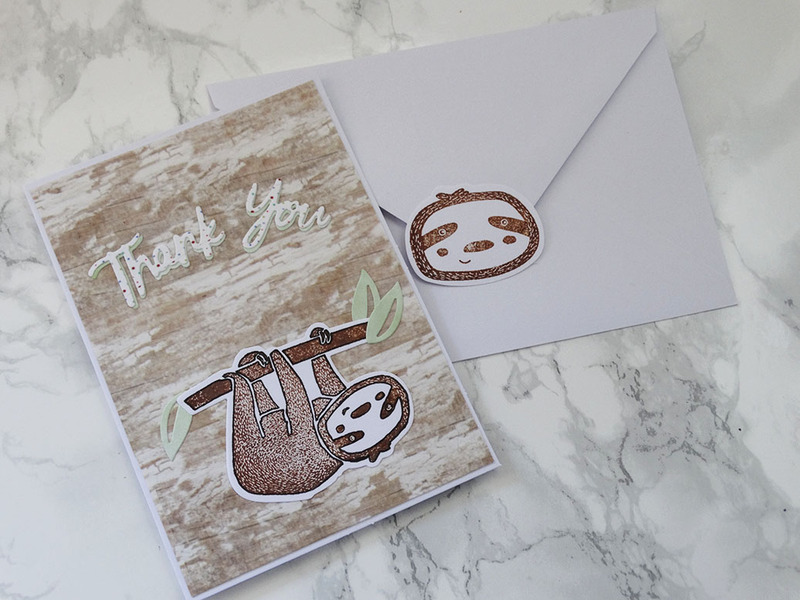 First up is this sloth thank you card you might have seen in my October outgoing mail post. I made this to send to Sarah in Canada and I used the sloth stamp and die-cut she’d sent me. I stamped the sloth using a brown ink, cut it out with the die and then decided I wanted it to have more definition so I outlined the image with a black pen. I used a small leave die and light green paper to cut some leaves to attach to the branch, for the background, I used three lengths of some really wide wood patterned washi tape to fill up a card front panel and then I die cut a thank you sentiment from some scrap paper. This next card is another you’ll have seen. I sent this one to Emma in the UK for her birthday. It features a hoard of cats stamp (that I believe I’ve used in the past for cards I’ve sent to her…). The image would be cute coloured but I don’t have the patience for that so I like to leave it black and white which I think also looks great. I stamped ‘happy birthday’ with some versamark ink and gold heat embossed it to make it shiny and stand out but I figured the card needed some dimension so I stamped the cats again and cut out the first row to add to my card panel with some dimensional dots. Fussy cutting isn’t my think but I admit this stamp is great for layering if you have the patience to fussy cut around those cats. So I did and I moved onto another birthday card for my grandmother and decided I should probably think about what I was doing first which turns out, made it work out a little better. I started with a blue – purple watercolour panel I’d made ages ago and never used. That was my colour inspiration. 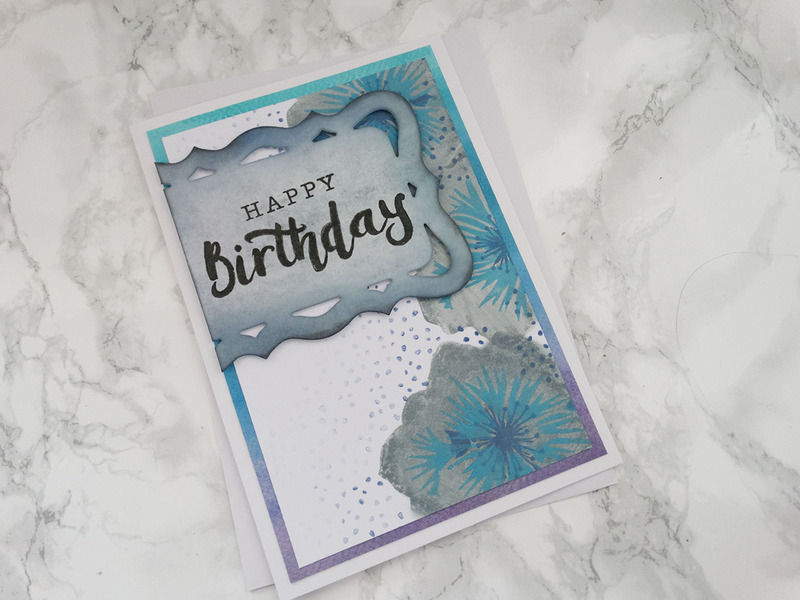 I decided to use a fairly large simple floral layering stamp I’ve had for a while and stamped the first solid layer in grey three times on a white piece paper. The great think about the distress oxide inks I used is that the colour shows up nicely, even when stamped over other colours so for the second layer, I used light blue and it showed up great. For the third, I used a dark blue. I had stamped all along the right hand side and the left was looking plain so using a small dotted stamp that came in that same floral stamp set, I used the dark blue ink and repeat stamping to fade the dots off and just give the background something going on in it. 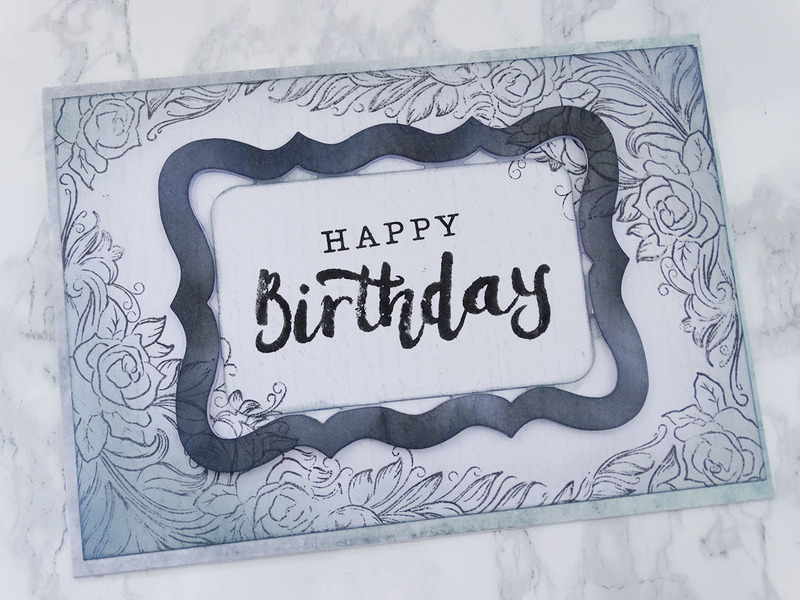 Using that same die from the previous card, made a panel to stamp ‘happy birthday’ again and used the inks and blender tool to add colour. I cut off the side of the die, stuck it on with some foam dots and then just everything on to that watercolour panel. So that was pretty much my card making from October. It really wasn’t much but what do you think, which is your favourite? Oooooh i abdolutely love the one with the kittys!